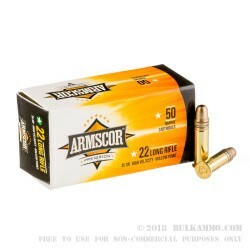 Armscor brings you this affordable hollow-point .22LR ammo in a 500-round brick. The 36-grain hollow point travels at a muzzle velocity of 1260 feet per second, putting it in the “high velocity” range for 22LR cartridges. It will offer strong performance against small game and serve well in target shooting or plinking as well. Armscor is an ISO certified ammunition and firearms manufacturer based in the Philippines. Headquartered in Manila, the company is the OEM manufacturer for a variety of familiar guns including Rock Island Armory, Charles Daly and Auto Ordnance 1911s. The company’s US division, Armscor Precision International, operates from Nevada. In addition to making small arms and ammunition, Armscor operates a reserve unit in the military of the Philippines, the AFP Arsenal Battalion. 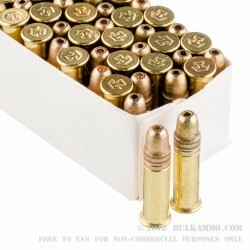 Good Ammo at a Good Price! Great price for very good ammo. Dirty ammo. Accuracy lags behind some less expensive ammo. These rounds are fairly accurate. The ammunition doesn't foul barrel with residue, and my P-22 Walther shot and functioned well with this product. The batch of ammunition I received had uniform velocity and muzzle discharge. Very good, consistent ammo, no leading of barrels and even velocity. Never buy it for a semiauto. It misfeeds 30% of the time in Colt Woodsman, AR7, and Beretta U22. It is VERY waxy. Most rounds will chamber only if I wipe each round thoroughly with a cloth rag prior to loading the magazines. Value is zero to me. Maybe I got a bad batch, but that is the manufacturer's problem because I won't buy Ascor again. This ammo seems very good to me. Ordering from BulkAmmo is very trouble free, and they ship very quickly. This is especially nice when almost no one has ANY .22lr in stock; and you can drive around all day and not find any. My Sig Mosquito loves this stuff! The aftermath really showed how dirty they are and unreliable. The lesson to remember is "You Get What You Pay For". After seeing what appeared to be a good value round, I purchased 1k rounds of this, and ~200 rounds through my brand new 10/22, I have made the decision to not buy these again. While shooting, it seemed that almost one out of every two or three rounds was either FTE or FTF with performance getting much worse when using a BX-25 mag. FTF bullets appeared to have pieces of the bullet impacted/shaved off of the round as well, obviously, this makes me nervous. This round has to be some of the dirtiest 22lr ammo I have yet to use. After the 200 rounds were fired the inside of the rifle was fouled almost completely black. Regardless of price, this is not the performance I expect or require of ammo I use. Shot about 300 rounds through several different rifles and a revolver. In all cases it shot a little dirty and required more frequent cleaning of the chambers to continue feeding reliably. Only had a couple duds in the batch (typical of this caliber). Accuracy was on par with other bulk 22 ammo, little more smoke than others which contributes to it's being a little dirtier than other ammo. For the price it performed as expected, shot better than expected (accuracy) was more maintenance needy than expected. ammo just arrived today via Fed ex. Love Bulkammo and their prices. excellent buy for .22 LR. you wont find a better price anywhere. Q: Can these be picked up with a magnets? A: Hello Jason! This ammunition is loaded with a copper plated, lead projectile. As a result, it does not contain any steel and will have no issues passing a magnet test. Q: What is the velocity specs on this ammo? Thanks. A: Hello Randy, Armscor lists the muzzle velocity at 1260 fps for this ammunition. Q: What is the velocity of these? 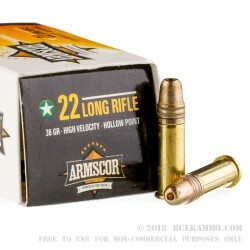 A: Hello Scott, Armscor lists the velocity of this 36 grain HP round at 1260 fps. Q: Are these copper jacket? 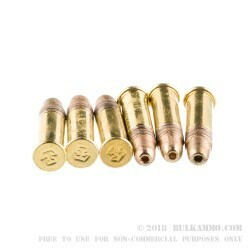 A: Hello Rick, This .22 LR ammunition features a 36 grain copper plated hollow point bullet. Q: What type of bullet dose this ammo have? Is it a fulljacket hollow point? A: Hello David, These 36gr. HP rounds by Armscor in .22 LR have a hollow point projectile. Armscor was plating them, so they are not copper jacketed. They make excellent target rounds for your .22 LR firearm. A: Hello Robert, These 36gr. HP rounds by Armscor in .22 LR function great in a semi-auto pistol. These rounds are great for target shooting and you shouldn't have any issues with them.